With space-conscious designs and lively, modern styles, Israeli furniture is gracing living rooms, children’s bedrooms and dining rooms from the United States to France to the Netherlands. Improbable as it sounds, the best pillows in the world may come from the beleaguered Israeli border town of Sderot near the Gaza Strip. You can purchase them alone or together with a high-tech bed. Both were developed by an artichoke farmer. But you need not come all the way to Israel to shop. The upscale Short Hills Mall in New Jersey and the equally chic King of Prussia Mall in Pennsylvania feature these “sleeping systems,” as their Israeli manufacturer calls them. Nor do you have to shop in Ramat Aviv for the prizewinning sofa beds that are so popular with Israeli youngsters and flaunt flamboyant colors, sleepover capacity and storage for extra blankets and sports gear. They are available for purchase in 20 countries around the world. Once a couch potato, the Israeli furniture industry has gone dynamic. Not only are Israeli manufacturers attracting local buyers, but customers abroad have taken a new interest in what Israelis are sitting, lying and eating on. In fact, the easy-to-tote, washable, durable plastic table and chairs you may be using for the Fourth of July barbeque this year might well be blue and white as well as red, white and blue. The Keter Group, based in Herzliya, is Israel’s leading manufacturer of do-it-yourself and plastic products. Keter makes functional and attractive garden furniture, among other plastic goods, under its own and other brand names for customers in the United States, Australia, the United Kingdom, Germany, France, Spain, Italy, the Netherlands, Belgium, Canada, the Former Soviet Union, Sweden, Finland, Norway and Denmark. Other manufacturers in Israel are following Keter’s example, taking advantage of one of the most advanced plastic production lines in the world. How did Israel move from citrus groves to chaise longues? A survey conducted this year for the Israel Furniture Industries Association revealed that 72 percent of Israeli consumers today prefer buying local brands to imports. They believe that native products are better suited to the limited space of Israeli apartments, that manufacturers take into account the country’s abundant sunshine, which can fade fabrics, and that companies understand that Israelis use pails of water to mop the ubiquitous stone or tile floors. Hence, furniture has to be more compact, fade-resistant and come with a splashboard. Israel’s manufacturing industry now employs about 11,000 men and women in 2,000 different businesses spread all over the country. The wholesale warehouses are located mainly in south Tel Aviv. Fortunately for manufacturers, features of Israeli life have begun to dovetail with international trends in household furnishing. For example, most Israelis have white walls and like bright colors in fabrics and on furniture. Today, decorators frequently recommend a “color surprise” to break up demure décor. Looking for a purple armoire or a green loveseat? You can easily find one in Israel. In America, dining rooms have been shrinking in size, often disappearing altogether. Israelis have always looked for tables that fit into a small space and then open up when the extended family comes for a visit. The evolution of Etz Hamishalot, Wishing Tree, a modest company headquartered near Ben-Gurion International Airport that specializes in such tables, exemplifies the history of changes in the furniture industry. Last year, Zohar won first prize in the Adaptation and Innovation 2007 design competition sponsored by the Israel Furniture Industries Association for his Long Island table. The table gains its name because, with its three extensions in place, it is quite long—seating up to 24 by gently pulling one side of the table. It also has internal, movable legs; comes in mahogany, African walnut, pine, maple and cherry; and costs between $3,500 and $7,000. Israel’s Channel 10 television station ran a story about the innovation, and an Israeli family living in Florida called Wishing Tree to order the table. The first buyer has become an agent and regularly exports the Long Island to, well, Long Island. Just as Israelis tend to invite outsiders for dinner, they have never been inhibited by the lack of guest rooms in offering out-of-towners a place to sleep. The typical apartment always had at least one sofa bed. Today, such couches have moved out of the living room into children’s rooms or home offices. And because Israeli homes rarely have built-in closets, attics or basements for storage, manufacturers are always coming up with useful storage solutions within the furniture—places for bedding, toys and school supplies within the furniture frames. The veteran company Aminach (literally, my nation rests), whose main complex is in Ramle, started in a small workshop in 1948. In the 1970s, it developed a combination couch-bed-storage unit called Sapapa (a takeoff from sapa, Hebrew for couch) and has become the generic term for convertible Israeli sofa beds. Aminach also invented the “bed and a half” in 1994. It is a wider bed, adjustable with a lift-up back that can take kids from youth to adulthood. The new and popular Extreme Sapapa series features bold colors—lime green, magenta and tangerine among others—ultramodern style and below-the-bed storage. It is also available with a multimedia cabinet that looks like a spaceship. Aminach has rivals in Israel, of course. Another Adaptation and Innovation competition winner came from Aeroflex, second-place winner for Bed in a Box. Inspired by the jack-in-the-box toy, the sofa expands into a bedroom set that includes armrests that turn into reading lamps and a front that opens into a shelf and bench for sitting or storage. Innovative designs are lavished on children’s rooms, which have come a long way in the last decade. Because Israeli children typically share a bedroom, there’s particular emphasis on ways to give children some private space. To meet this challenge, Shegem, with stores throughout Israel, produces modular, self-contained combinations of desks, shelves and beds where, for example, one brightly colored piece includes a pull-out bed and desk as well as a top bunk. The steps to the top bunk are also storage drawers and its side doubles as a bulletin board. Zula, in Kiryat Bialik near Haifa, makes easy-to-clean desks, beds and armoires in vibrant colors—bright blues, purples, greens and oranges. Galmor Designers, with a factory in Emek Hefer, between Tel Aviv and Haifa, produces a bunk bed with a top bunk that is also a playhouse with windows, even sporting flower boxes on the sides. And for parents who wind up spending more nights than they want to admit with their young kids climbing into their beds, Galmor has adult bedroom sets with pull-out beds. Once a year, furniture designers and retailers show their wares at Rihutim, the International Furniture Exhibition held at Ganei Hatarucha, the Tel Aviv Exhibition Park. Tens of thousands of Israelis, including professionals and businesspeople from the furniture sector as well as the public, come to see the offerings during the fall. More than 60,000 square feet are filled with everything from synagogue pews to closets for shoes. The pews come from Kibbutz Lavi near Tiberias in the Galilee. The kibbutz manufactures and exports institutional furniture to the United States, Canada, France, England, Belgium and Russia. Its pews are in Temple Beth El in Allentown, Pennsylvania, New York’s Or Zarua synagogue as well as Ben-Gurion International Airport. At Rihutim, the displays of bedroom furniture, mattresses, dining rooms tables, chairs, cupboards, upholstered furniture, kitchens, children’s furniture, accessories, carpets and decorative items are a mix of imports and, increasingly, locally designed and produced goods. To show off the durability of their products, the popular local manufacturer Betili (a play on the Hebrew for my home), a local retailer, displayed a couch with a new fabric the company had developed to withstand a busy, child-filled home. Salespersons were pouring ketchup on white suede-like upholstery, rubbing the dreaded red sauce in and then nonchalantly wiping the stains off with damp wipes. In addition to the well-established companies, said Nave, cadres of inventive young designers are coming up with ingenious fixtures and custom designs that are attracting international attention. 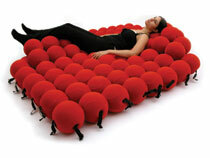 “On one hand,” she added, “there’s a tremendous emphasis on creativity in our design programs, and on the other, an understanding of practicality.” Sarit Attias and Amit Axelrod, a young married couple and the talent behind the company Animi Causa, created the Feel seating system of elastic fabric balls in bright colors in 2002. Art-school graduates, they had photographed each other in various sitting positions. Studying the pictures, they came up with the idea of using soft balls for comfortable seats and beds. Their design, which retails from $900 and $2,900, can be seen at showrooms in Italy, Japan and Germany and at the Los Angeles County Museum of Art. Orders have followed, from Israel—including for the physically challenged because the seating system is so comfortable and can be adapted to different needs—and from abroad. Designer Dror Benshetrit, who works in Israel and New York and has created vases for Rosenthal china, makes the BBB Pick Chair, a foldable chair that doubles as a piece of art. The chair ($1,630 to $1,800) is made from decorated wood veneer with a hinged metal structure that ensures it will hang flat on a wall. Shai Ohana, who began designing when he was 14, runs Metalika, his workshop and studio of ultramodern custom-made furniture, in the port city of Ashdod. He creates living room wall units for flat-screen televisions that include the screen itself as a design element and have lights, shelves and drawers. “It’s so much cheaper to do custom design in Israel than in London,” said Ohana, who loves minimalist styles combining, say, mahogany and brass. He has customers in Europe and the United States who order furniture direct from Ashdod. And those super pillows made in Sderot? Isaac Barssessat, a Moroccan Jewish farmer with a creative flare, brought the artichoke to Israel. But his back hurt so much from bending over the plants that he searched the world for a bed and pillow that would provide relief. Typical Israeli beds at the time were foam rubber mattresses on wooden platforms. American-style inner spring mattresses, even if they came with fluffy ticking, left him groaning. He was willing to trade his artichoke profits for a good night’s sleep. He settled on a bed he liked from the Netherlands and began proselytizing among other back sufferers, importing the mattresses under the fitting brand name Hollandia International. But after a while, he wanted to improve on Dutch technology. Barssessat designed a pillow that uses flexible latex to support the head and neck—no matter how much one twists and turns at night. The pillow, which costs $100 and comes in several styles, is covered on one side with a fabric that allows free passage of air and on the other with a stretchy fabric treated against perspiration. Issac Barssessat also redesigned his mattress. Numerous focus groups and meetings with orthopedists contributed to the final design, which rejects both box springs and the more stoical flat foam rubber. The price for the company’s sleeping system can reach $50,000, but that’s not only for a cozy bed. The new Hollandia comes with a 12-program massage feature, a music system, a flexible shoulder comfort zone and customized seasonal sleeping for winter and summer. The company’s newest youth bed, Groovy, adjusts to numerous positions and comes with built-in corner speakers. Today, Hollandia beds are exported around the world, including the United States and, of all places, the Netherlands. “Some of the customers come because of Zionist support,” said Avi Barssessat, “but the majority realize they spend almost a third of their lives in bed and don’t want anything but the best. Among the top young designers in Israel today are graduates of Hadassah College Jerusalem’s Department of Industrial Design, which attracts people from around the country. The school’s creative outpouring was displayed last year at the Jerusalem Centre for the Performing Arts with many furniture innovations. Lev Meital addressed the chronic lack of space in student apartments with storable cardboard tables and chairs that can be taken out and unfolded for surprise guests. Lawn furniture that looks a bit like very comfortable pebbles are the work of Anel Chakun. “Young people know that furniture used to be only about fashion,” says Segal. “Today, it’s still fashion conscious, but also about innovation, green design and ecology. Because we have a developed furniture industry, as opposed to, say, an automotive industry, they know that there’s a good chance their ideas will have an impact. That’s empowering.” —B.S.